It’s a fine line between perfection and obsession. 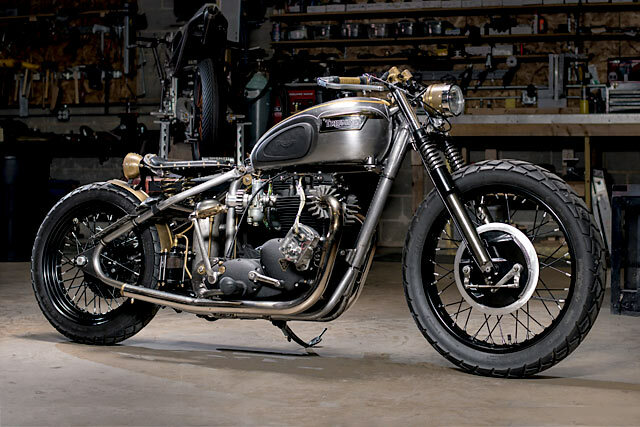 One that is probably crossed once you find yourself customising a bike more than once. 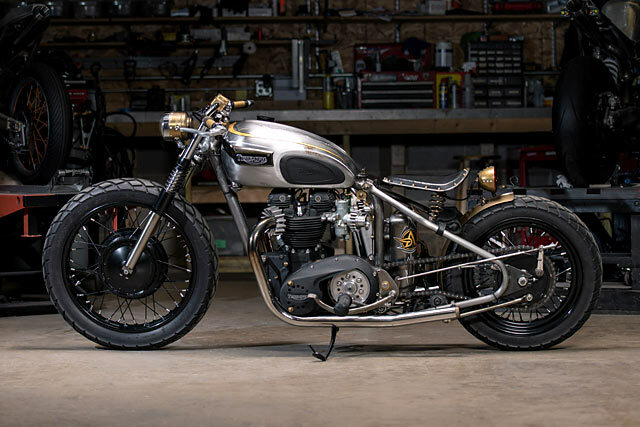 After achieving what most of us would find almost impossible to do the first time, Analog’s Tony Prust took a perfectly amazing ‘72 Triumph Bonneville bobber he built 5 years ago and decided to have another go. Who says you can’t gild a lily? 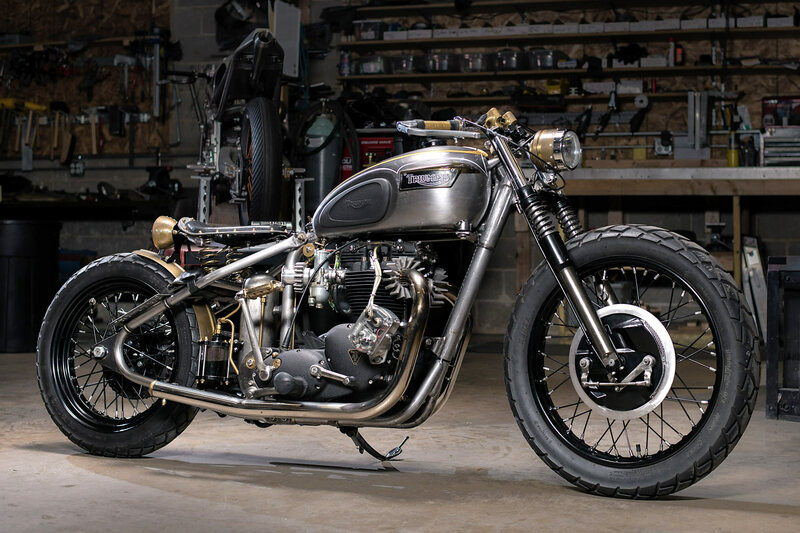 Wasting no time, Tony jumped straight into the build details of this, his personal ride. “We call it ‘El Matador’. It’s a ’72 Triumph Bonneville 650 Engine in a ’68 Triumph Bonneville 650 frame running a late 60’s BSA front end.” Phew. 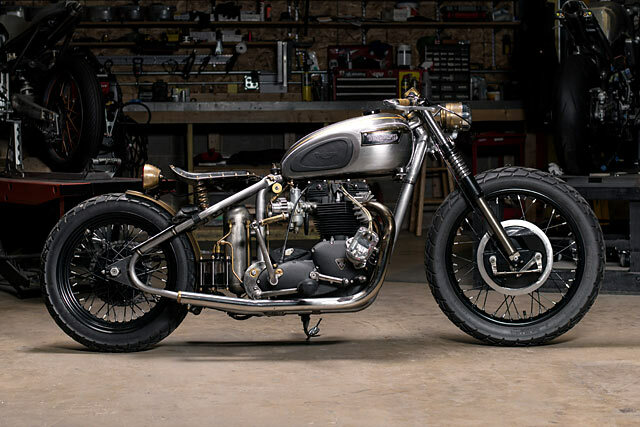 It’s clear is that the bike has come to be a sort of mascot for the company. While its sale has been on the cards for years, it always seems to be there every Monday morning when the shop’s doors are opened. What a way to start the week off. “I built this bike for myself and started it shortly after I opened Analog Motorcycles. And when I say ‘started it,’ I mean I started accumulating parts over the course of a year. Then I built it the following year. It was a basket case chopper in rough shape that a friend of a relative of a friend had lying around. But even in 2009, a clean titled Triumph of this era was well worth the $600 I paid for it”. Tony’s first box to be ticked was to build a bike he actually wanted to ride, own and that he was proud of. He also wanted it as stripped down as possible. 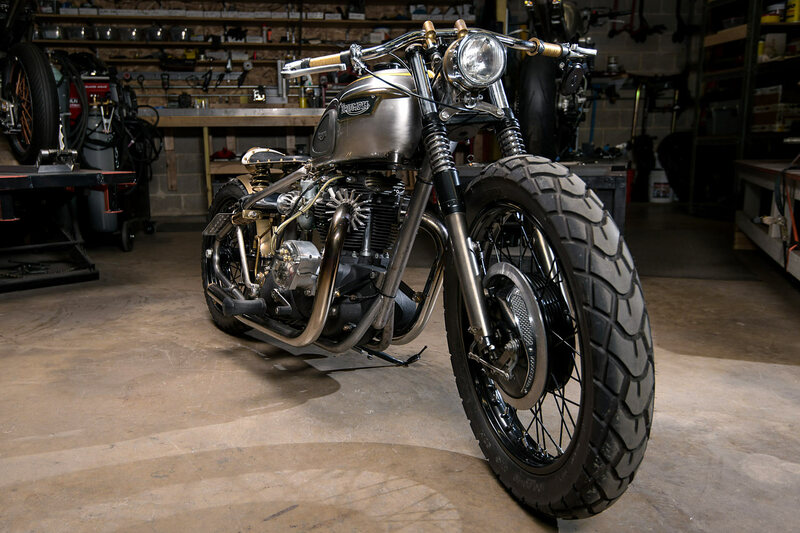 “I was just starting and cutting my teeth on vintage Japanese models, so an old Triumph was a bit different. 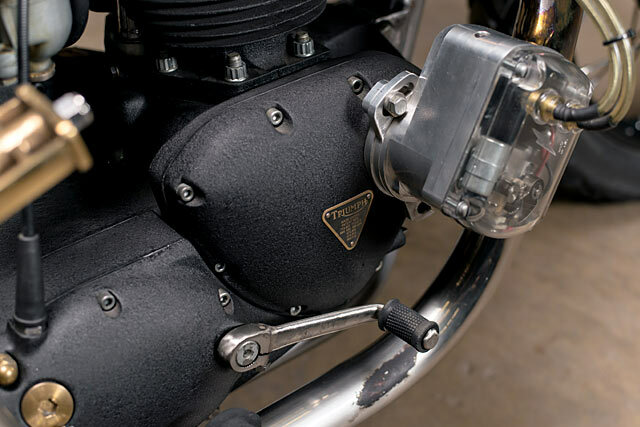 I loved the look of the engine, so I wanted it to be a key piece of the puzzle”. With the ‘modern classic’ Triumphs increasing in popularity at the time, he figured it would be cool to make the engine black like a new model to really throw people off. It has previously been called ‘steampunk’, but Tony is quick to point out that he hates that term. “It’s not ‘steampunk’ at all. 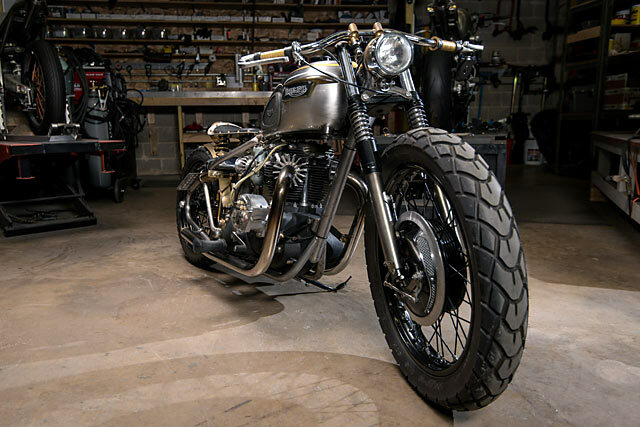 The intent when I built it was to let the steel and brass patina over time and it would look its best years from when it was built, like a good single malt”. Originally, the frame was a stock ’68 piece and Tony picked up a David Bird bolt on hardtail to suit. A few other bits were sourced from swap meets over the years. 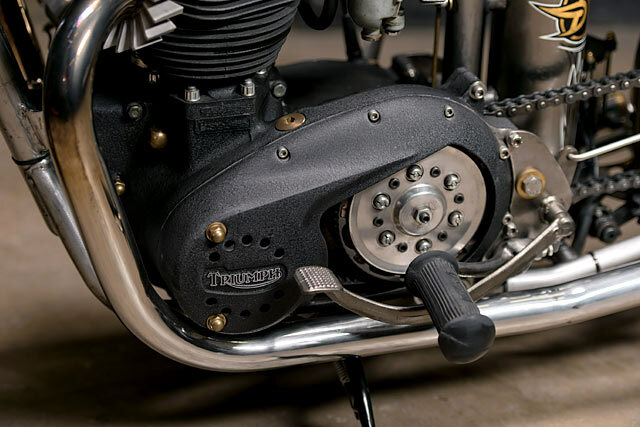 The accompanying chopper had a hydraulic brake and an extended front end from a ’76 (or later) Triumph. 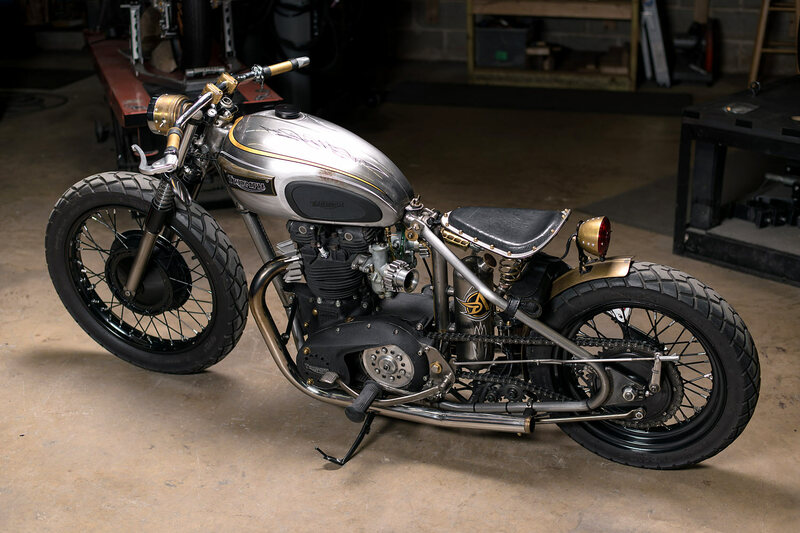 “I picked up a late 60’s BSA front end and twin leading shoe hub and the rear wheel was a conical hub I got from a swap meet”. During the mock-up, Tony had custom rear spokes made so he could centre the wheel in the frame while also keeping the drive line straight. “If you have ever laced one of the conical hubs to a 16″ rear wheel it’s off center, but that annoyed me so I fixed it. Then I made the taillight using an old brass apple; the headlight was built from a vintage brass cigar tin”. Various other brass bits were sourced from Low Brow Customs amongst others. 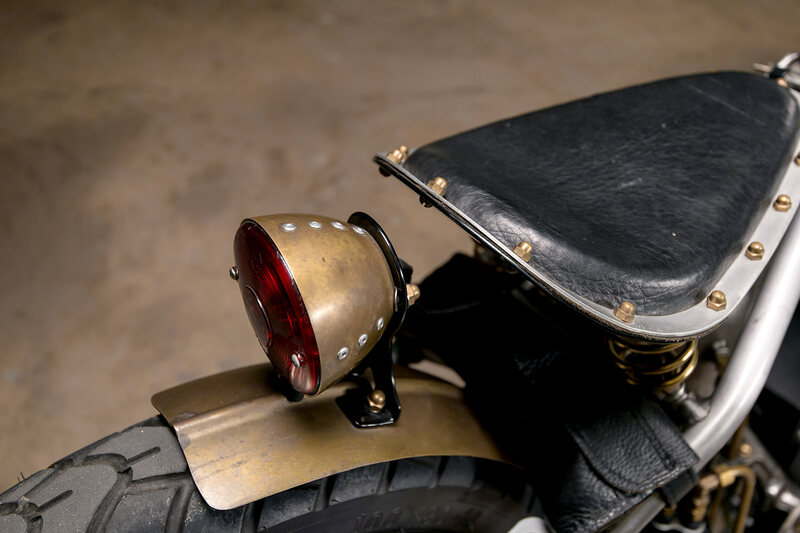 7 Metal West in Milwaukee made the rear fender out of solid brass. This last year, Tony sent it back for a ball detent transmission conversion, as the old version of the shifter spring in the transmission was proving problematic. A few broken spokes were fixed, and he also redid the front forks to be a little stiffer and more dampened; he machined some new parts and a spacer in the forks that have improved the ride considerably. 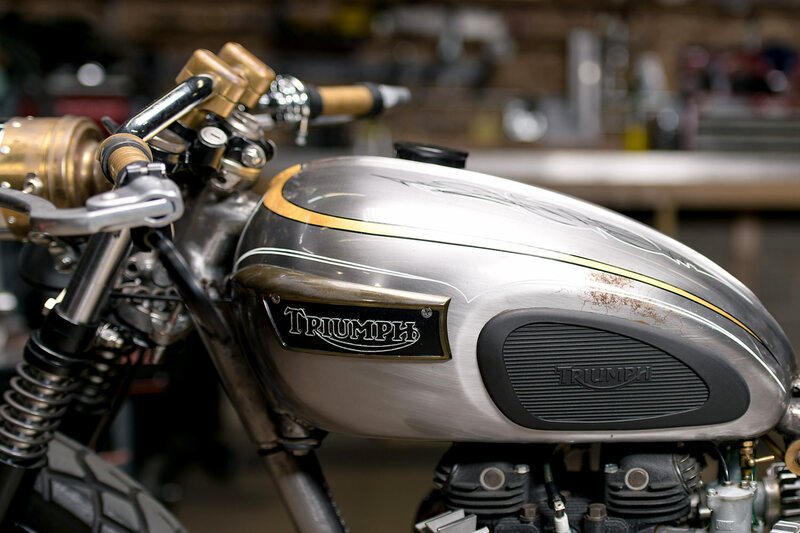 “Tuning and dialling in an old Triumph that we put a magneto on was a real challenge. At the time, we had little to no experience with the bike or the task. Still, we got it sorted after that first season of riding. It also took a few versions of the exhaust mounts to get one that wouldn’t brake. We wanted to keep things simple, so we finally settled on a rubber dampened frame clamp at the rear that has worked nicely for the last few years. 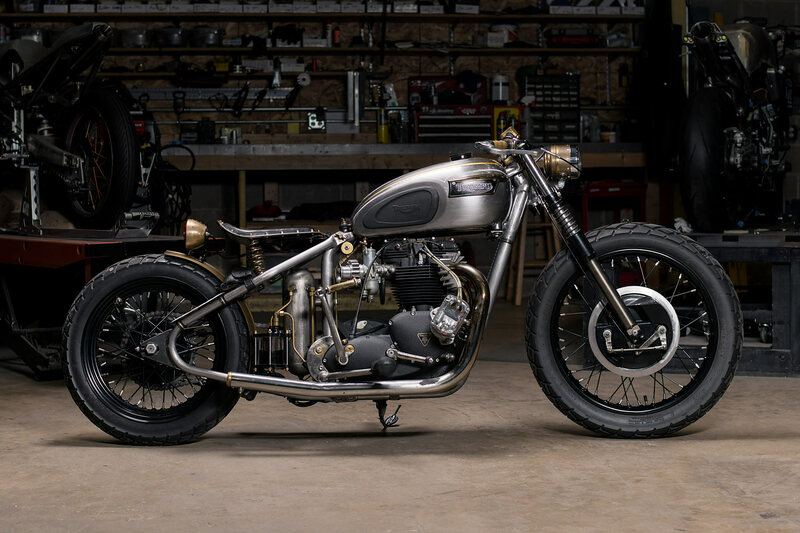 As you’d expect, An old Triumph engine in a rigid frame makes for some powerful vibrations”. 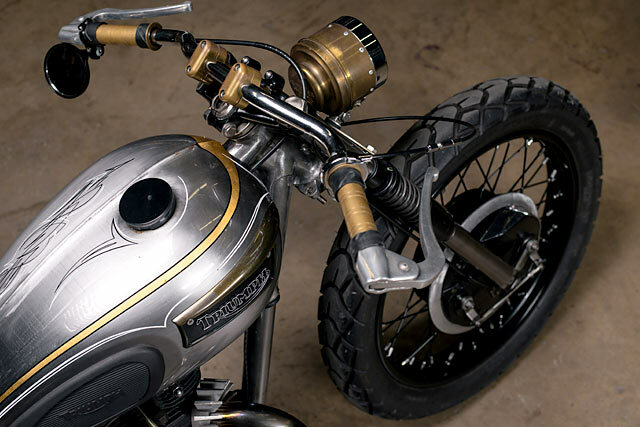 “I like how well the metal has started to rust in a spider’s web way under the clear coat. I also like how the brass has started to dull over time and turn various different colors. It is really something you need to see in person to appreciate. 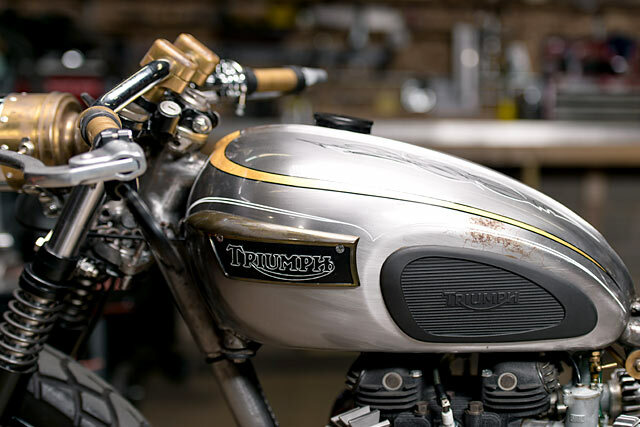 It took a few years but now the Triumph is looking well-worn. I love that I have ridden it a lot and I think it really shows.” It sure does – especially if you go by the smile on Tony’s face.